The idea for One Smile came to me while in Detroit on the People Mover. My then 3-year old son Jordan and I decided to give up our seat for a lady standing and holding a baby. He wasn’t sure that he wanted to stand and I knew he wouldn’t be able to see as well. But, he did. The woman was grateful. Well, I love books. I love words. So it seemed natural to write about this and writing a book was something I always knew I would do someday anyway. Why not then? So I started brainstorming ideas, drafting, revising, editing… and didn’t stop until I had a story that I loved. I wanted all of the acts of kindness to be simple, things that regular people (especially kids) could do. I also knew I wanted many of the characters to be children so kids could know that everyone (big or small) can make a difference. I wanted to share it with as many kids as I could (and grown-ups, too) so I sent it out to about 20 different publishers. At first, I got a lot of rejections. They weren’t very fun to read, but friends reminded me that even Dr. Seuss’ first book got rejected a bunch of times before someone wanted to publish it. So I kept waiting. Then, a few months later, a company (Illumination Arts) called me and said they loved the story and wanted to turn it into a book. I had almost not even sent it to them because their note said they get thousands and thousands of stories every year and they only publish one or two. I thought I would never have a chance, but if I loved the story, maybe they would, too. I took a chance and it sure paid off. I signed a contract for One Smile with my editor John Thompson just 8 months after I wrote it. (I still can’t believe how lucky I am!) He helped me revise and edit the story into what you see today. No matter how much your teacher makes you edit your writing, it is nothing compared to what One Smile went through! Even though the publisher is in Washington and I live in Michigan, we faxed and e-mailed changes to each other more than 60 times! When we were all done getting the words just right, the illustrator took over and made the pictures. 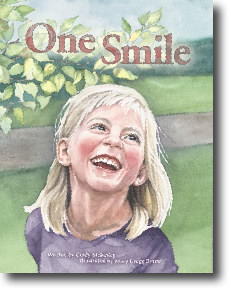 One Smile actually had a totally different illustrator at first. But, we didn’t feel that the pictures were what the book really needed. Then we found Mary Gregg Byrne. Her beautiful watercolor illustrations were a perfect compliment to the words and really brought the story to life. There is one goof-up in the illustrations, though... Can you find it? When you read One Smile I hope that you are inspired to think about the things you do and how your actions (all of them) affect other people. I hope that you will take more notice of ways in which other people are kind to you. I also hope you are encouraged to be nice to others... and then notice how good it feels!!! Go, now, and look for ways to be kind. Look for ways to change the world!